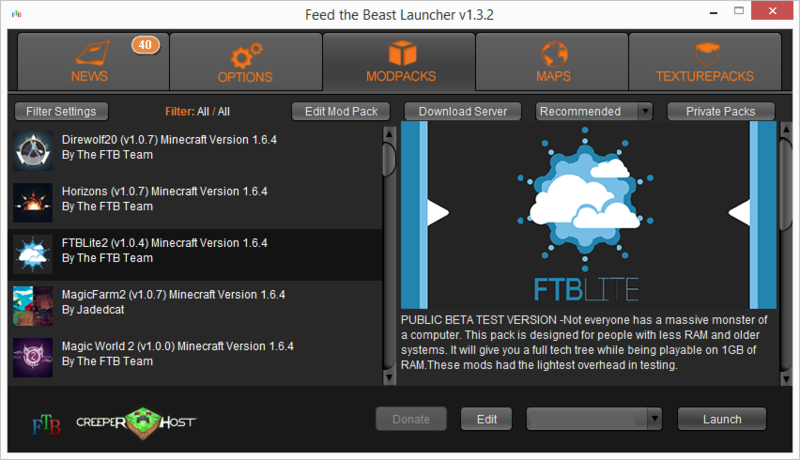 Feed the Beast's Monster modpack is the MC 1.6.4 replacement modpack for FTB Unleashed. There's over 150 mods included in this pack with unlimited possibilities. Like FTB Monster? Play the GigaTech mod pack. Construct factories, work magic, go to space. So much to do along with classic mods like Industrial Craft 3, Buildcraft 3, Thaumcraft and much more! Done! You can now player singleplayer FTB Monster or multiplayer FTB Monster. That's it! You have successfully installed FTB Monster and can now launch it. Biomes O Plenty - Flostride, Adubbz, etc.